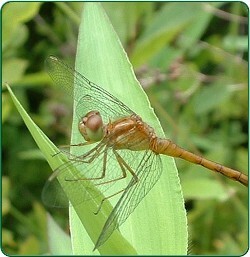 Discover the amazing world of local Dragonflies. FRANCONIA, NH - You're invited to enjoy a great evening of learning about the wide and wondrous world of dragonflies in our region at Franconia Town Hall on Friday August 17th at 6:30 p.m.
Ammonoosuc Conservation Trust founding member and avid amateur naturalist, Carl Martland of Sugar Hill will show his own photographs of more than two-dozen dragonflies you might spot locally, and talk about their life cycles and where to find them. ACT's speaker events are free and open to the public although donations are gladly accepted. The program is geared toward adults, but all are welcome. Save your spot and help us plan accordingly by registering at act-nh.org/education-events. The Ammonoosuc Conservation Trust is the North Country's lands conservancy, protecting land for the vitality and well-being of our region. Learn about our other workshops and outdoor recreation or become a member at act-nh.org or by calling (603) 823-7777. The Ammonoosuc Conservation Trust is the North Country's lands conservancy, protecting land for the vitality and well being of our region.